The "Circumetnea" is a special train that travels through the beautiful landscape of the Volcano Etna, in eastern Sicily. It is so called because it allows travelers to circle the entire volcanic region in just a few hours. 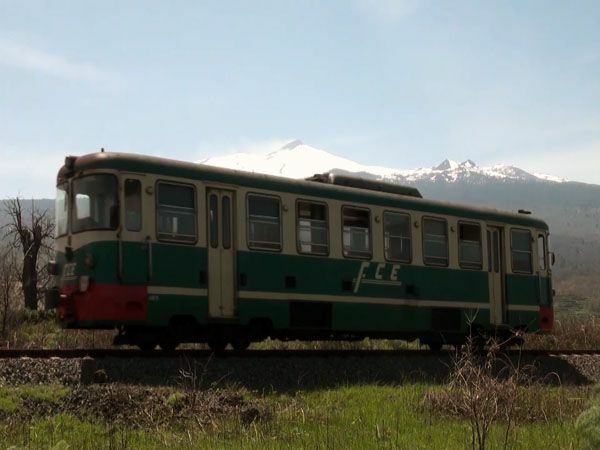 The train, still used by citizens and students, starts from Catania and goes through small and picturesque villages, passing through old vineyards and hills of black lava. The landscape is very impressive, and allows you to take beautiful pictures. Through towns bordering the sea like Giarre, Mascali, Piedimonte and Linguaglossa we reach Randazzo, a charming medieval town, and then we return to Catania via Bronte, Adrano and other villages in the Etna province. A charming and fascinating journey throughout the year, except, unfortunately, on Sundays, when the train does not run.